At number 8 in Rolling Stone Magazine’s list of the 100 greatest songwriters is Paul Simon. Simon is one of my favourite songwriters; I would place him in my personal top 5 and I consider him one of the greatest lyricists in popular music, along with Bob Dylan and Leonard Cohen. However, in addition to his incredible lyrics, Simon has an ability to consistently write memorable melodies. Simon was very much at the vanguard of introducing other musical elements into western popular music. His seminal 1986 album Graceland is possibly the best known example of this, where he went to South Africa to record with some of the country’s black musicians. But, in fact, Simon was including foreign influenced rhythms and music into his songs long before this. “El Cóndor Pasa (If I Could)”, released in 1970 on the final Simon and Garfunkel album, was based on a traditional Peruvian melody. “Me and Julio Down by the Schoolyard” (released in 1972) and “Late in the Evening” (released in 1980) are other examples, both with strong Latin rhythms. At number 8 in Rolling Stone Magazine’s list of the 100 greatest songwriters of all time is Paul Simon. There are so many Paul Simon songs which I like, and I have blogged about several of them before. Here I blogged about his album Graceland, and in that blogpost I included two versions of his song “Under African Skies”. Here I blogged about his haunting song “American Tune”, and here I blogged about his song “Leaves That Are Green”, which he performed with Art Garfunkel during their days together. Finally, here I blogged about “The Boxer”, which appears on the final Simon and Garfunkel album before they split. Today I thought I would include two Paul Simon songs, one from during his time with Art Garfunkel, the other from his solo career. “America” is a wonderful example of Simon’s ability to paint vivid pictures with his lyrics. Released in April 1968, when I first heard it as a teenager I had no idea where “Saginaw”, “Michigan”, “Pittsburgh” or “the New Jersey Turnpike” were. Ironically, when I moved to the United States in 1992 and bought a road map of the country, one of the first places I spotted on the map of Michigan was Saginaw. Several years later, when I was working at Yerkes Observatory in Wisconsin, we had a visit from some high school students from Saginaw. I asked them whether they knew the song in which their town had been immortalised, but they did not (I guess they were too young!). The opening lines of “America”, “Let us be lovers, / We’ll marry our fortunes together. / I’ve got some real estate / Here in my bag.” just draw you straight into the song. This song is just perfect, it completely enchants me each time I listen to it. The other song I have decided to share is one that I mentioned above, “Me and Julio Down by the Schoolyard”. This song shows the other side of Simon’s songwriting skills. There is nothing particularly profound about the lyrics; but I challenge you to listen to this song and not start at least tapping your hands or feet, if not wanting to start dancing. It just has a completely infectious rhythm. This song features on Simon’s first solo album after the breakup of Simon and Garfunkel, simply entitled Paul Simon and realeased in January 1972. Which is your favourite Paul Simon song? Either from his time with Art Garfunkel, or from his solo career. At number 11 in Rolling Stone Magazine’s list of the 100 greatest songwriters is Bob Marley. 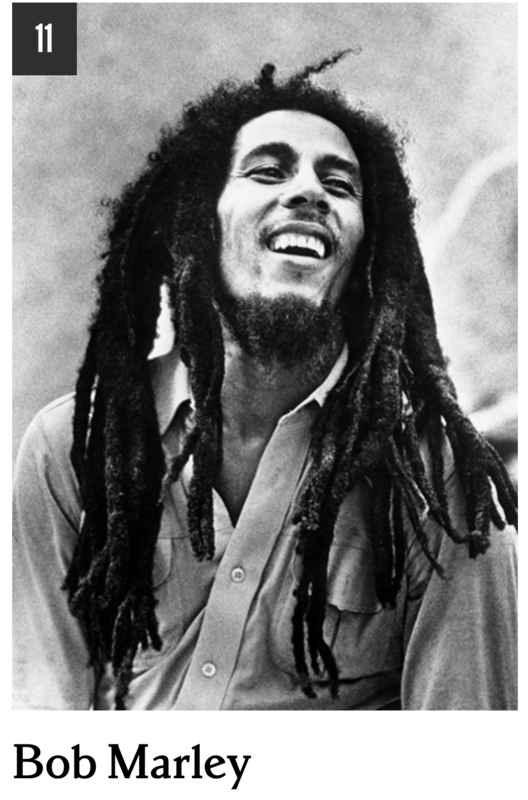 Although Marley didn’t invent reggae music, he essentially took it from its Jamaican roots to become known worldwide. With songs about redemption, alienation, civil and human rights, as well as love songs, Marley’s work spanned a broad range of topics, and has touched the lives of millions on every continent. Born Robert Nesta Marley in rural Jamaica to a black mother and a white father, his upbringing was one of poverty. He rarely saw his father, and when he was ten years old his father died. When he was twelve Marley and his mother moved from her parents’ farm to Trenchtown, a poor suburb of Kingston, Jamaica’s capital city. With barely any money to eat, Marley and his mother struggled to survive. As a teenager, Marley become increasingly interested in music and in 1962, when he was only 17, he recorded his first songs. He rose to fame in the early 1970s; but in 1979 he was diagnosed with cancer of his toe. He died in 1981 at the tragically young age of only 36. At number 11 in Rolling Stone Magazine’s list of the 100 greatest songwriters of all time is Bob Marley. The song which I have decided to share today is ‘Redemption Song’, written by Marley in about 1979 and on his ninth studio album Uprising. It was also released as a single, and is rated by Rolling Stone Magazine as the 66th greatest song ever. Unlike most of his music, this is just Marley with his acoustic guitar, no band behind him, no reggae. I carried Bob Marley’s Redemption Song to every meeting I had with a politician, prime minister, or president. It was for me a prophetic utterance or as Bob would say ‘the small axe that could fell the big tree.’ The song reminded me that freedom always comes with a cost, but for those who would prepare to pay it, maybe “emancipation from mental slavery” would be our reward. At number 14 in Rolling Stone Magazine’s list of the 100 greatest songwriters is Bruce Springsteen. Springsteen is one of my favourite songwriters, I would rank him in my personal top 10. I first came across Springsteen in the late 1970s, when I became aware of his 1975 song “Born to Run”, and bought the album Born to Run on the strength of liking this song. Springsteen was born in 1949 and grew up in a working class home in New Jersey. His father was mainly unemployed, and this poor upbringing coloured much of his music throughout his career; many of his songs deal with despair and desperation. Springsteen’s first album was the 1973 Greetings From Asbury Park N.J. (Asbury Park is a city in New Jersey and located on the Jersey shore. It is part of the New York City metropolitan area). The first track on this debut album, “Blinded by the Light”, was released as a single, but failed to make any impact on the charts. It was later covered by Manfred Mann’s Earth Band, who had a number 1 hit with it in 1977. I remember this song in 1977, but at the time I had no idea that it was written by Bruce Springsteen; I had no idea who Springsteen was until about 1979. At number 14 in Rolling Stone Magazine’s list of the 100 greatest songwriters of all time is Bruce Springsteen. Springsteen’s breakthrough album was his third, Born to Run, which was released in 1975. This album opens with the incredibly energetic song “Born to Run”, one of the great rock anthems of all-time. This song was released as a single in August 1975 and was Springsteen’s first single to be released worldwide. Its chart success was modest, but it has since gone on to be considered one of the greatest songs of all time, Rolling Stone Magazine ranked it at 21 in their list of the 500 greatest songs of all time, I blogged about it here. 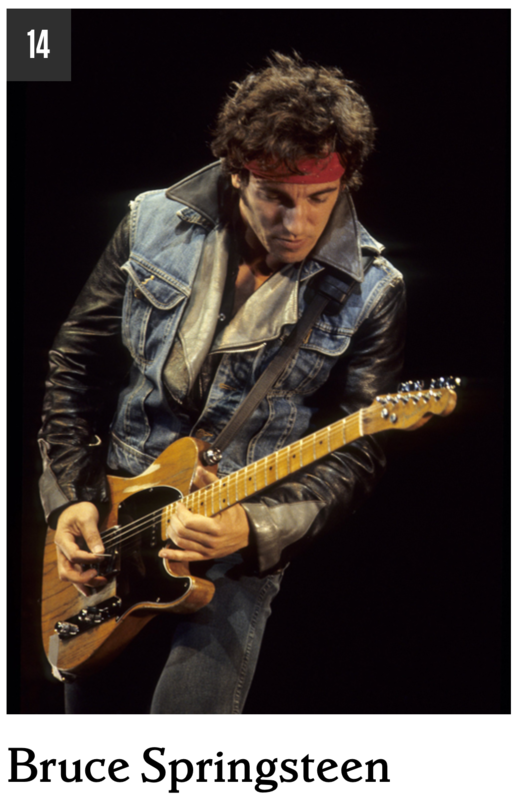 After Born to Run, Springsteen went on to have a string of hit albums and singles, including “Hungry Heart”, “The River” (which I blogged about here), “Dancing in the Dark” (one of his biggest hits), “Born in the U.S.A” (one of his best known songs) and “Streets of Philadelphia”. The song which I have decided to share today is his 1994 hit “Streets of Philadelphia”. This poignant song was written for the movie Philadelphia, a movie starring Tom Hanks, who won an Oscar for his performance of a lawyer who contracts HIV and is fired from his job. It illustrates beautifully Springsteen’s songwriting skills, both with its wonderful lyrics but also its haunting melody. Here is the official vide of this wonderful song. Enjoy! 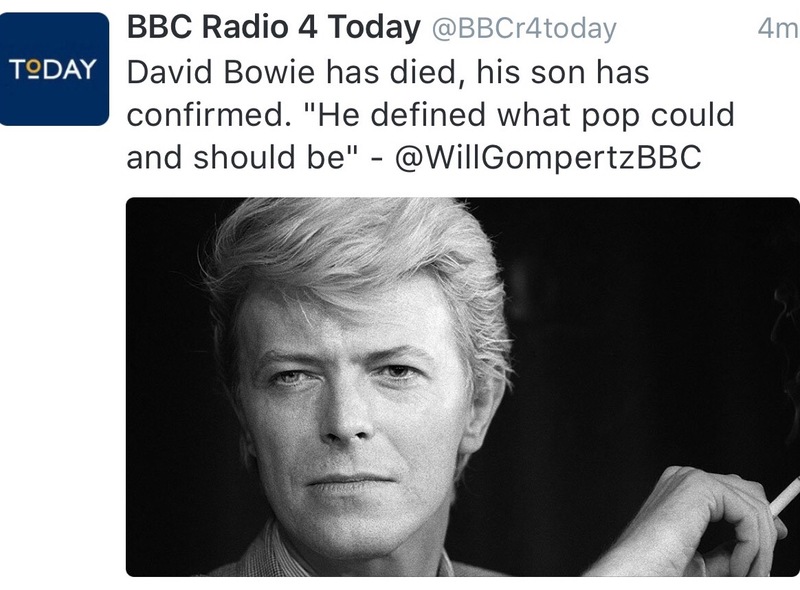 On Monday I blogged about the death of David Bowie, who died on Sunday (10th of January) of liver cancer at the age of 69. I wanted to put something up quickly, so that blog I wrote on Monday was written within 15-20 minutes of hearing the news of his death. I actually heard it breaking at 7am Greenwich Mean Time, I had been listening to the radio since about 6am. Now I have had a few days to collect my thoughts, I have decided I will do a more detailed and complete blogpost about his death. In fact, this will be a two-part blog, on the 26th I will do a part 2, as I need to get back home to Cardiff to access something about Bowie which I want to share in the second part. When the news broke of his death I was overcome with a profound sadness, the most sad I have felt about the death of a singer or celebrity since the tragic killing of John Lennon in 1980. This reaction surprised me, but as they were playing Bowie’s songs on the radio throughout the morning I realised that Bowie’s music had been the soundtrack to my teenage years. I always preferred 60s music when I was growing up in the 1970s but, of all the music being produced in the 1970s, it was Bowie and Queen’s music that I liked the most. As they played song after song of Bowie’s on Monday morning, I wept for the memory of my teenage years. 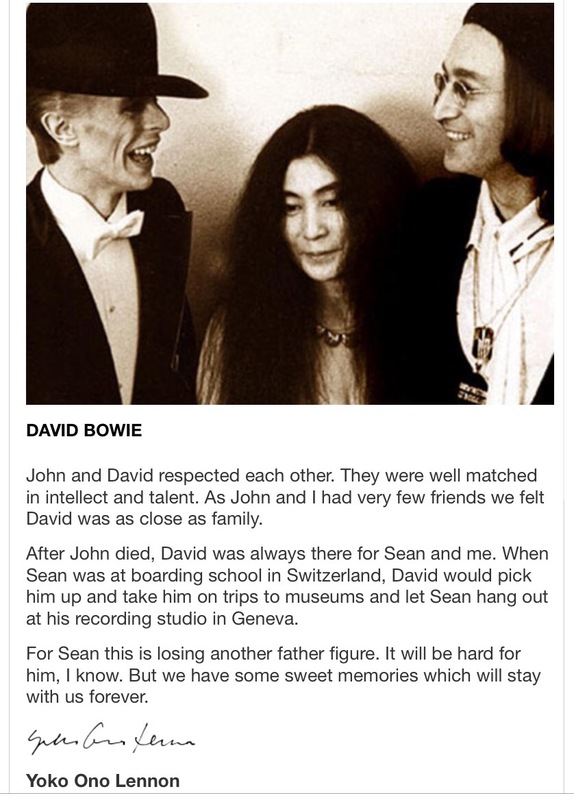 I also got emotional thinking about the strong connection that Bowie had with John Lennon, who was (and still remains) my music hero. When I read Yoko Ono’s tribute to Bowie I could not contain my tears. This is what she said (you can read it on her webpage here). 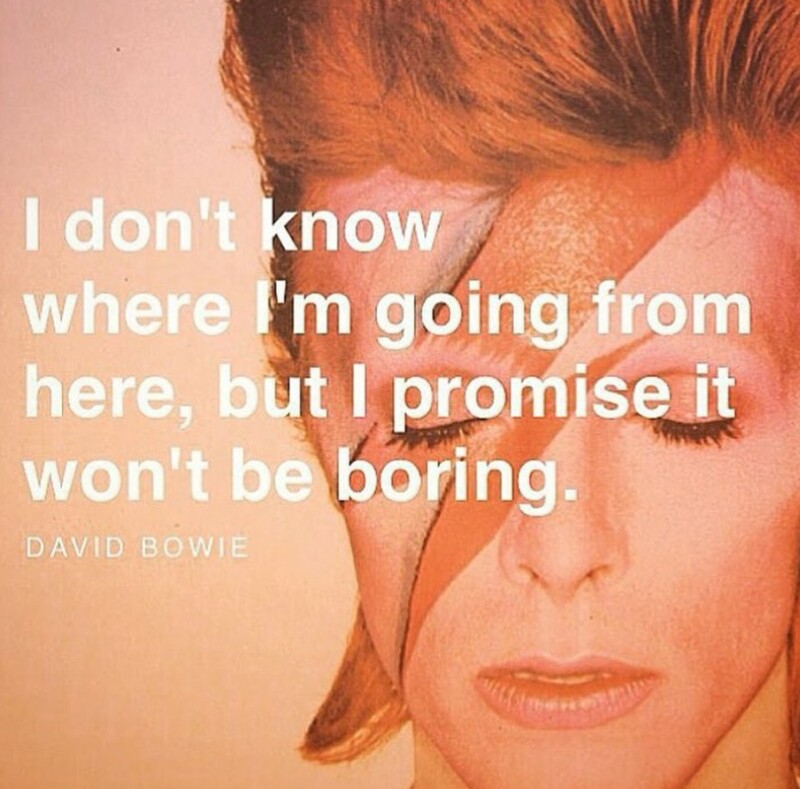 Bowie was probably the artist of anyone I can think of who changed most frequently throughout his career. The chameleon of pop. He was, by his own admission, a very restless person (in fact he put it down to Attention Deficit Disorder). He would quickly get bored with one incarnation and changed to something different. I didn’t like all of his incarnations, particularly his heavy metal ‘Tin Men’ phase; but I liked many of his ever-changing styles. Here is a small gallery of some of his incarnations. From hippy to Major Tom, to Ziggy Stardust to Aladdin Sane to the Thin White Duke and his ‘Let’s Dance’ period, he was the consummate restless artist. And, he will be sorely missed. It would be wonderful to think that Bowie has reunited with his dear friend John Lennon and that they have been catching up, since last seeing each other the week before Lennon was murdered in December 1980. Today I am going to start my countdown of the top 30 songwriters according to Rolling Stone Magazine – I blogged a summary of the top 100 in this blog here. 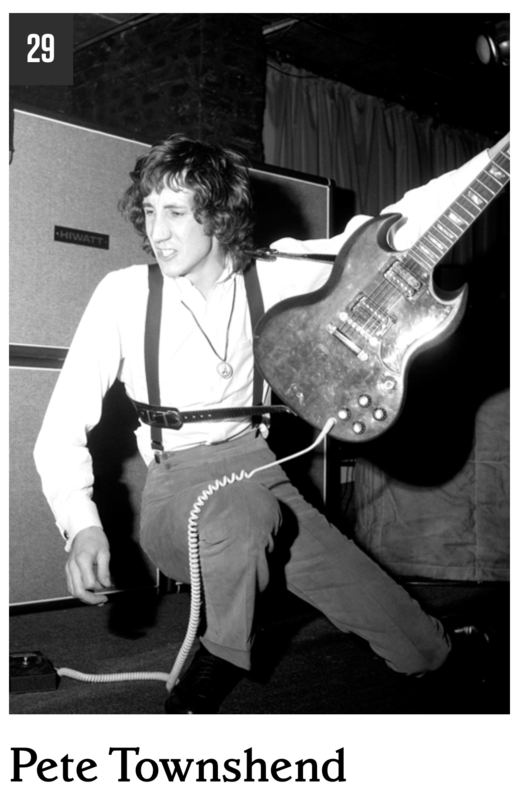 At number 30 in their list is Pete Townshend, who was/is The Who’s songwriter and lead guitarist. I have already blogged about my favourite Who song “Won’t Get Fooled Again” here, and also their best known song “My Generation” here. So, today I thought I would blog about their song “Pinball Wizard”. At number 30 in Rolling Stone Magazine’s list of the 100 greatest songwriters of all time is Pete Townshend of The Who. “Pinball Wizard” was the hit song from The Who’s rock-opera Tommy, and the reason I have chosen to blog about this song is that it shows Pete Towshend’s ambition; writing a rock-opera is not something many other songwriters who had sung in the 1960s had done. But, Towsend often saw things on a bigger canvas than many of his contemporaries, and writing a rock-opera illustrates this nicely. The first version of “Pinball Wizard” which I remember hearing was the 1975 version sung by Elton John, who sung it in the movie version of the rock opera. I only later became familiar with The Who’s version, which was released in 1969 on their album Tommy. It was also released as a single and got to number 4 in the Disunited Kingdom and to number 19 in the US Singles charts. Elton John’s 1975 version reached number 7 in the DUK. A pinball wizard’s got such a supple wrist. ‘How do you think he does it? Here is a video of Elton John’s version of “Pinball Wizard” as he sung it in the movie Tommy. And here is Tho Who’s original version, with Roger Daltrey singing it.